Summit Bank (Pvt) Limited Pakistan. Career Opportunities: of the following positions are available at Summit Bank Limited. For Branches: Karachi, Hyderabad, Lahore, Multan, Faisalabad, Islamabad, Peshawar and Quetta. Age: Should not exceed 45 years for the position of Branch Manager and Operation Manager and 30 years by the position of Universal Teller. Must be Law Graduate with at least 3 years of relevant work experience of handling Corporate / Commercial and Legal matters in the banking sector. Age should not exceed 35 years. Must be either a professionally qualified ACCA / ACCA Finalist or MBA with minimum 3.0 CGPA. Fresh or having at least 3 years of relevant work experience. Must be CISA qualified and have at least 3 years of relevant work experience. Market-based salary package in accordance with experience and knowledge will be offered to the suitable candidates. 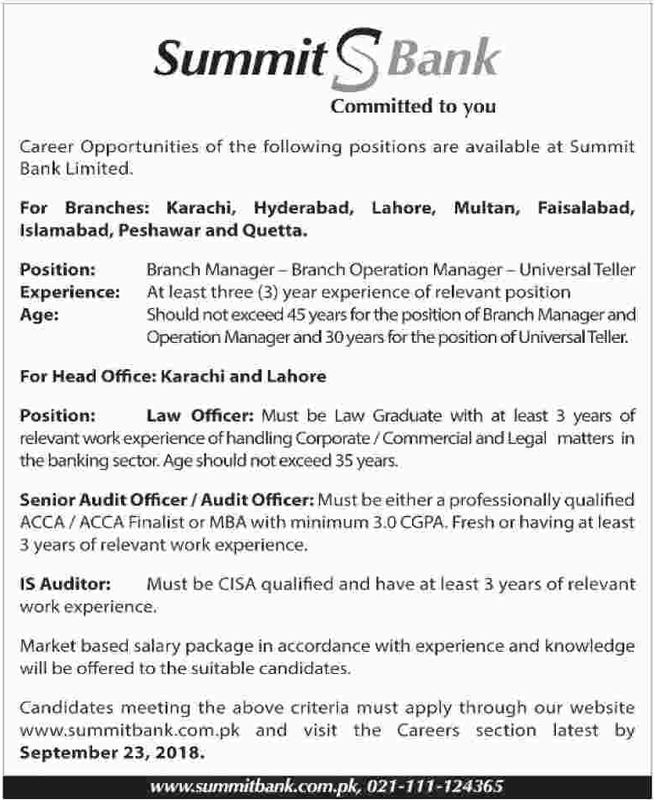 Candidates meeting the above criteria must apply through our website www.summitbank.com.pk and visit the Careers section latest by September 23, 2018.